Buy one or stack a few, these thin rings are perfect for any finger. Available in yellow, white or rose gold the rings can be plain, with diamonds or with gemstones to symbolize a special month or children's birthstones. A small sampling of the sleek fashion watches that will accessorize any outfit. She'll love the slim profile and elegant look. 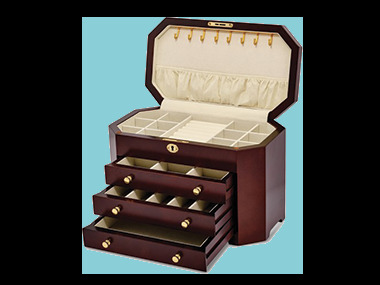 Jewelry boxes available in beautiful wood finishes with drawers and compartments to organize all her favorite jewelry. Insulated two bottle wine and cheese carrier for picnics, boating or to take to a friend's. This is a useful, yet appreciated gift. An inexpensive, fun bangle converts to purse holder when she is out for dinner or a drink. A mug for your sister or other favorites, you can even personalize with your own saying or photo. Choose something that symbolizes her family.